Stumbled on this one via the Prosthetic Center of Excellence News blog – the Sun Journal has an awesome story on a young below-knee amputee’s push to learn karate and earn her junior black belt! Now this is the kind of thing I love to read about – like the girl in the story, Jaedyn, I lost my leg when I was really young as well (click here if you want to have a read of my story), but I always wanted to learn martial arts, and I always had the support of my family and instructors in doing so. I tip my hat to her parents for encouraging and supporting her in this, I’d like to pass along a big thank you to her instructor for doing such a wonderful job, and a big high-five to Jaedyn for earning her junior black belt. This is such an awesome thing to share, and I wish her the best of luck on her journey. For those interested, please visit the site and have a read. The direct link to the story is here. Wifey passed along a story to me this morning – published in The Advertiser (13/5/2009, page 12), but originally published in The Daily Telegraph, it’s a piece on Paul de Gelder who had his right hand ripped off in a shark attack while testing equipment for the navy; due to the nature of the attack, he also had to have his right leg amputated below the knee. 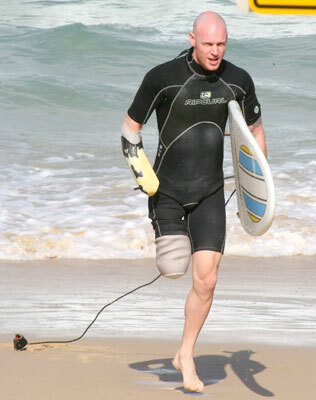 The awesome thing is that he’s back in the water now, and has started surfing again which is amazing considering the attack only happened a couple of months ago. Well done mate, good luck and keep it up! If you want to read the full story and see some more pictures, the story on The Advertiser’s website (AdelaideNow) is available here, and the original source (The Daily Telegraph) is available here. The text is similar between the two (they’re both News Ltd publications), but The Daily Telegraph has an image gallery attached to the story. If you want to skip to the gallery itself, here’s the direct link. Despite belief to the contrary, I haven’t dropped off the face of the planet 😛 Apologies to any regulars for the lack of updates for so long, it’s been ultra crazy around here lately. Wifey and I are still getting the house ready for sale, it’s been taking much longer than we thought, but it’s looking great. On top of that, we also celebrated our first wedding anniversary in July, I had my industry’s ultra huge conference/exhibition two weeks back that I was heavily involved in, and Wifey and I have been in Sydney holidaying and visiting my brother and his wife for the past week. Crazy stuff. As a result, I haven’t had the chance to train for about 6-8 weeks, but I’m finally in a place where I can get back into the groove of things. I’ll be training Wednesday night and starting back on my weekly regime of stretching and pushups/crunches/etc. I’m also going to do my best to knock out my love handles by trying a few more exercises that should do the job. I’ve also recently been in touch with a guy from the US who is an amputee martial artist. He coined the best phrase for it – amped fighters. He’s into full-contact mma, and I’d encourage you to check out his profile (click here). Even though we approach this from different angles (I’m going down a more traditional martial arts path, whereas Robert is going into the more full-on, full-contact tournament style with greater practical application), we’re both heading towards the same goal – to push our bodies to the max regardless of our physical condition. I wish him all the very best of luck and look forward to continuing to read up on his progress. So with that, I’ll leave you all to it. Thanks for sticking around, I’ll be looking forward to posting more as I go!